We got an early start Friday because we had a lot to do and we had only until sunset to do it all. Our first stop was a very brief one at the state capitol, the 15th state capitol that the Hamster and I have visited. They generally all look pretty much the same: marble or some other type of stone, lots of columns, big dome on top. Boston’s looks a bit different in that it’s yellow. And the big dome is not visible from the rear of the building, which is the side we saw first. Sam said this made the building look more like a mansion than a state house, and I have to agree. 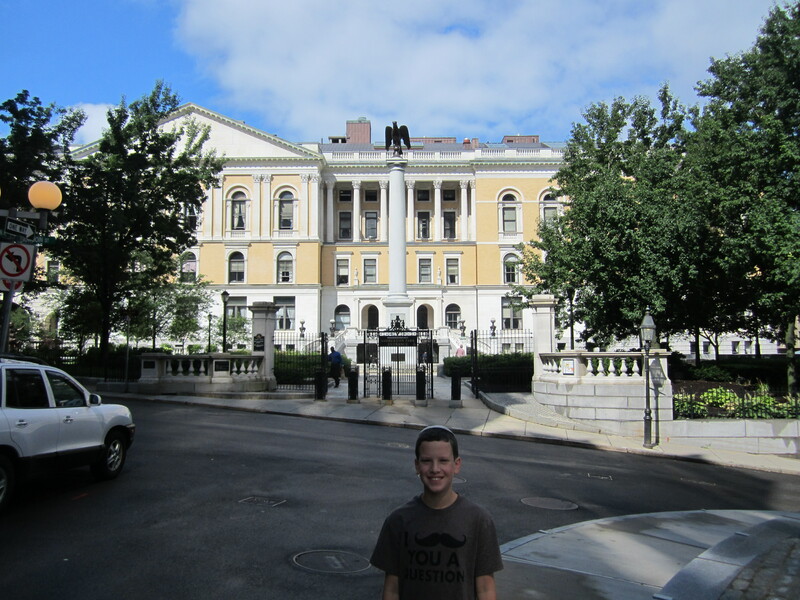 The first time I took Sam to Boston, we took a tour of the Freedom Trail, which included a lengthy stop in the cemetery that houses the graves of John Hancock, Mother Goose, the five victims of the Boston Massacre, and Samuel Adams. Our tour guide, who was clad in colonial garb, pointed to the bar across the street from the cemetery and mentioned that it’s the only place you can drink a cold Sam Adams while looking at a cold Sam Adams. 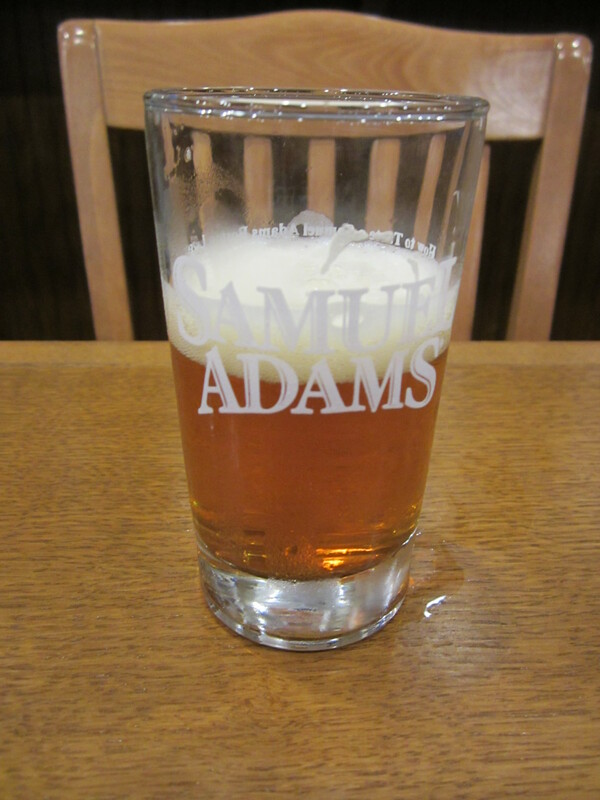 This time I decided to find a better spot to enjoy a cold Sam Adams: the Samuel Adams Brewery. This was my third brewery tour (I’ve been to Budweiser in St. Louis and Coors in Golden, CO), and it was by far the best. Mainly that’s because it was much more focused on the beer-making process and the way that various ingredients affect the taste and the process of the beer. And it did so interactively: we tasted barley that was malted to varying degrees and we mashed hops in our hands, which left our hands smelling fantastically hoppy the rest of the day. We even got a lesson in how to properly taste beer the way competitions do. Also, our tour guide, Alan, was freaking incredible. I knew I was going to like him when he started off the tour by saying, “I want to thank you all for coming here today. 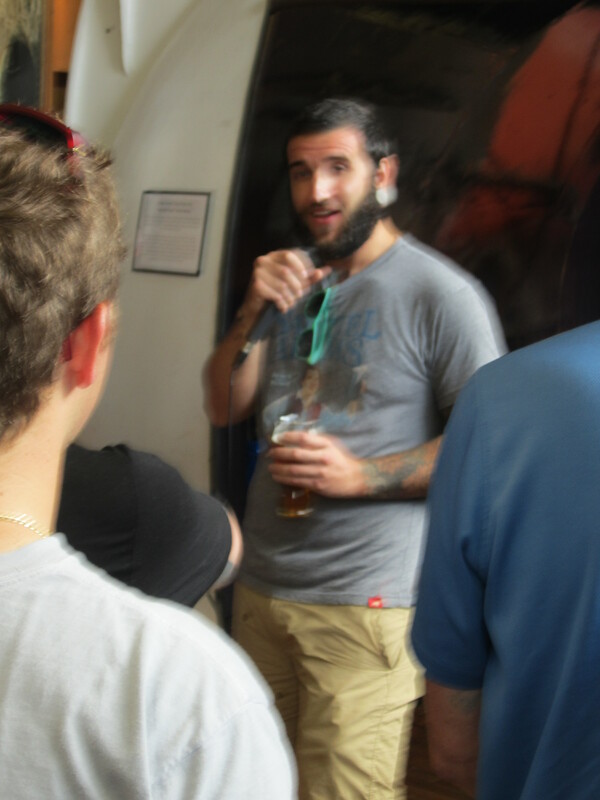 I know you have a lot of choices when it comes to places that will give you a free tour and free beer at 11am, and I’m very grateful that you chose us.” He was extremely knowledgeable, a craft beer evangelist, and hilarious. Plus he was already sipping a pint when he started the tour, which like he said started at 11am. That man has a good, good job. Poor Hamster, though, was bored out of his mind the entire time. He understood exactly none of what was being said, and he couldn’t taste the beer. In the tasting room they gave him a bottle of root beer, but he doesn’t even like root beer. 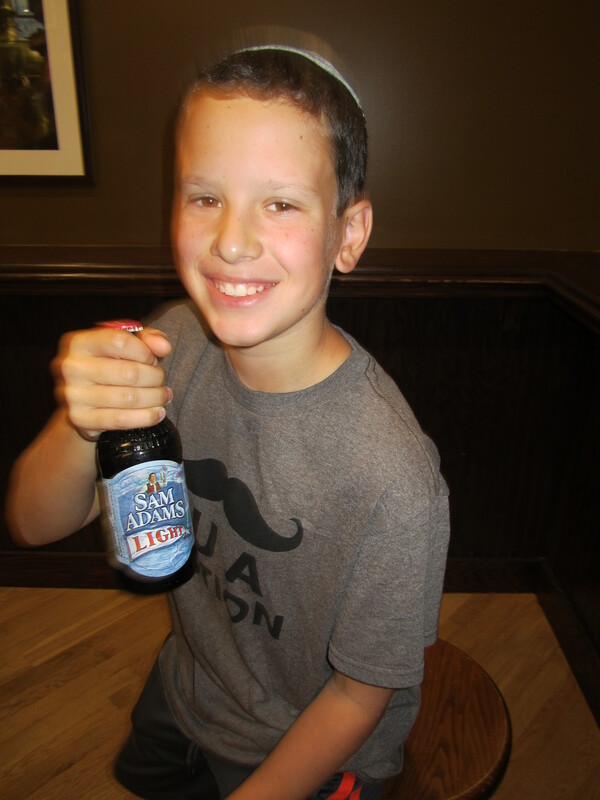 However, the tickets they give you for the tour are beer bottle labels, so Sam entertained himself by attaching his label to his root beer and pretending he had a bottle of beer. Our next tour was a lot more formal: a campus tour of Harvard University. Sam is 11 and he’s now toured three major universities (Notre Dame, Duke, and Harvard). This tour, like the one at Sam Adams, was free, but despite the phrase, you cannot actually “pahk your cahr in Hahvahd Yahd.” The only place to park is an underground lot that cost $20. Anyway, the tour itself was fine. The campus is stunning and the history is fascinating. Our student tour guide, however, was so over the top in her effusive exclamations of how incredible everything is at Harvard that it got ridiculous at times. One example: when she was raving about the Harvard’s great system of matching freshman up with roommates, she said that she and her roommate got along great and they “still talk to this day.” She just finished her freshman year in May. Anyway, we did see the famous Harvard Yard, sat on the steps of the library, and the statue of John Harvard, also known as the Statue of Three Lies. Why? Because the pedestal reads: John Harvard, Founder, 1638. Lie #1: Harvard was founded in 1636, not 1638. Lie #2: John Harvard was a benefactor to the already-existing college, not the founder. 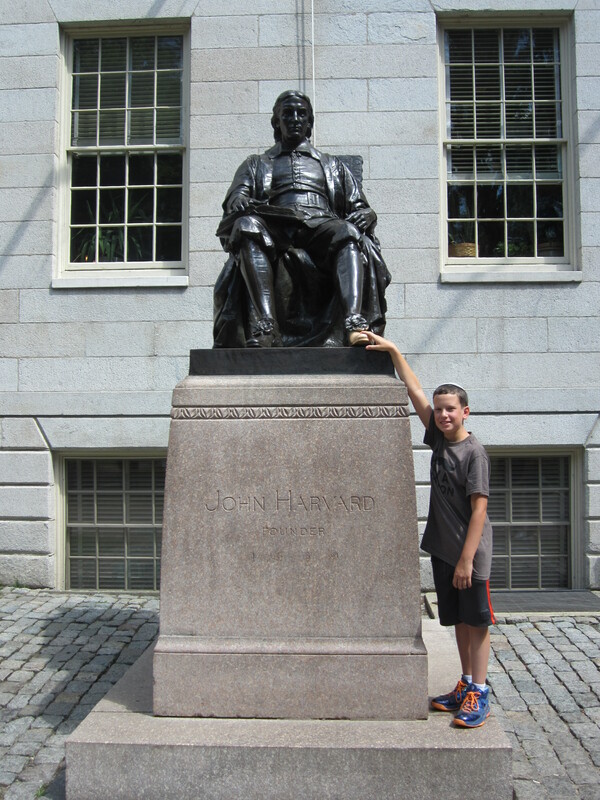 Lie #3: the statue is not of John Harvard. By the time the statue was commissioned, all known photos of John Harvard had been destroyed in a fire, so the artist picked some random student to sit in and the statue looks like him. Despite all this, or perhaps because of all this, our tour guide told us that John Harvard is the third most photographed statue in America, behind only the Statue of Liberty and the Lincoln Memorial. This is a commonly touted bit of trivia, but I find it so hard to believe that I’m thinking it might be lie #4. 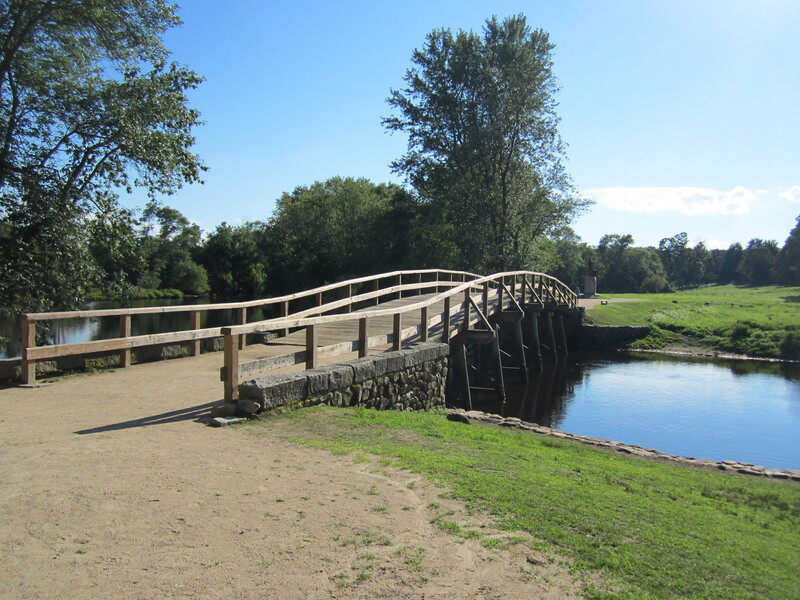 We enjoyed Harvard but we were ready for some real history, so we headed out to Concord to Minute Man National Historic Park, which commemorates the battles in Lexington and in Concord that started the American Revolution. The final battle that day stretched across 16 miles as colonial militias essentially chased British troops back out to sea; the park encompasses four miles of that battle road and several original buildings that survive from that time. In the main visitor’s center we watched a 30-minute multimedia movie about the day’s events, which included Paul Revere’s midnight ride (which was actually made by Revere and two other, less famous, guys named Dawes and Prescott). The movie was really helpful in giving Sam background and context so he could really appreciate the significance of everything we were seeing. From there we stopped at one of the original buildings, where we chatted with park rangers in colonial garb, and we finished at the North Bridge, a cute wooden bridge over a very calm river that looks so serene and peaceful that you’d never guess it’s the spot where the first order was given for colonists to fire on British troops. Near the bridge were various statues, plaques, and memorials, all of which were very poignant. 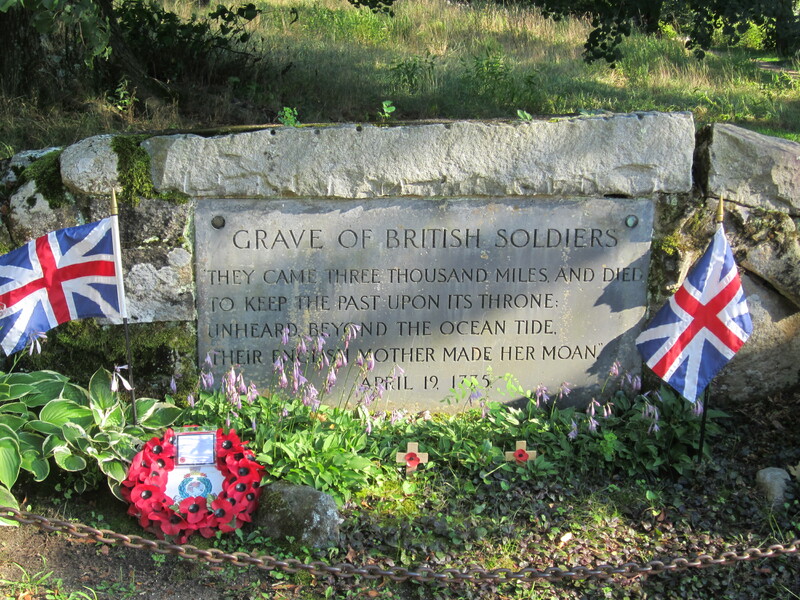 But the one that stuck out for me was the grave of the British soldiers who were killed that day, which I think is a beautiful and telling memorial to have. Until that day, the colonists were as British as those soldiers, and some of them had even fought alongside each other a decade or so earlier in the French and Indian War. It was nice to see that in all the commemoration over our fight for freedom and democracy, we haven’t completely forgotten that we were once one people. Despite the fact that the Hamster and I both kept accidentally calling the place “Minute Maid Park,” our trip to Minute Man National Park was very meaningful to both of us and led to some deep conversations later in the evening in which Sam expressed fear of ever fighting in a war because he might die, and couldn’t think of anything that he would be willing to risk his life for. Which makes perfect sense, because he’s 11 and he spends most of his time thinking about iPhones and sports and not about big, serious ideas like self-sacrifice and democracy and such. But it won’t be too long before he starts thinking about those things, and I’m glad he’s seen both the cost and the gains of some of the many, many people who have made such sacrifices so that he can waste his time thinking about iPhones and sports. I’m going to have to make it out to Boston, if only for th Sam Adams tour. You would LOVE the Sam Adams tour. But you’d be taking notes the whole time instead of laughing at the tour guide’s jokes.